Lysa & Huey Ink! : And Now, Some Awesome Crafty Goodness From the Hubster! And Now, Some Awesome Crafty Goodness From the Hubster! 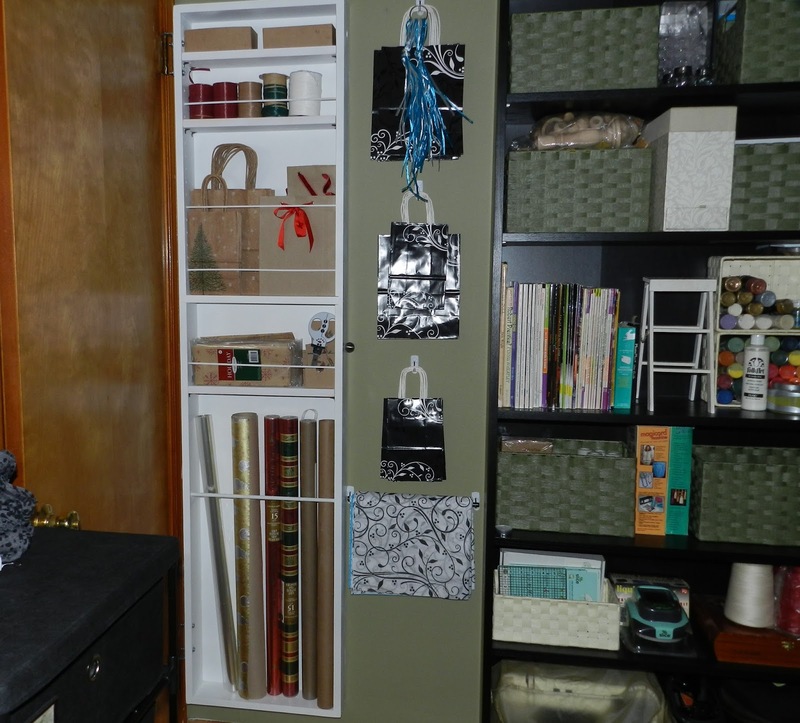 OK, being I was looking for gift wrap storage in the new craftspace I locked on right from the beginning. That was until I saw the $160.00 price tag. Not only that when I went online to research it a bit I saw it from Improvements catalog for a whopping $189.00! Come on its cool and all but $189.00. You know that is out of my price range for sure. Than I thought well maybe I would ask the family for it for either a birthday or holiday gift. I really did like it a lot. So I showed the Hubs a picture of it and he liked it too. But like me he thought the $$$ was a tad high. He looked me in the eye and said "I think I can make it" Now he really is the kind of guy that wouldn't say it if he thought he couldn't do it. And sure enough, don't you know I get home from work on Friday and he had made it! I just love it. Here are the pictures of my homemade version of the Cabidoor. I just love how when the door is open (which it almost always is) you would never know my gift wrap is happily living in a depth of 4 inches. I am so happy that I am using that space, in a small room like this no space can be wasted! Paul spent about $36.00 to make this awesome gift wrap storage for me. Here is my SHOUT OUT of thanks to Paul for making the craftspace even better and for making me one happy crafty camper! You da best Hubby EVER!!! Is there any chance that your super talented Hubby would share instructions on how to make this awesome bit of goodness?